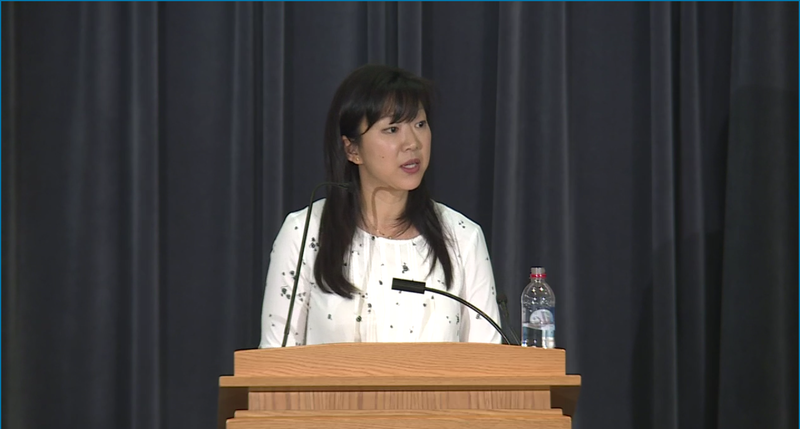 Poet and lawyer Monica Youn speaks at a poetry reading in 2016. Photo courtesy of Wikimedia commons. Former lawyer and award-winning poet, Monica Youn, will present on Nov. 2 at 7:30 p.m. for Butler University’s Visiting Writers Series. Youn has published three poetry collections titled “Barter” (2003), “Ignatz” (2010) and “Blackacre” (2016). In 2010, “Ignatz” was a finalist for the National Book Award. Youn’s most recent work, “Blackacre,” was longlisted for the National Book Award and named one of the best poetry collections of 2016 by the New York Times. It won the 2017 William Carlos Williams Award of the Poetry Society of America and was a finalist for the National Book Critics Circle Award and the PEN Open Book Award. Youn has also been featured in publications such as The Best American Poetry, The New Yorker and The Paris Review. Youn has received poetry fellowships from the Library of Congress, the Rockefeller Foundation and Stanford University. Earning a Bachelor of Arts degree from Princeton University, a Juris Doctor degree from Yale Law School, and a Master of Philosophy degree from the University of Oxford, Youn is an especially trained academic. Until 2013, Youn was a lawyer first and a poet second, specializing in media and entertainment law and eventually public interest election law. According to an interview with the Rhodes Project in 2013, Youn’s focus switched to poetry when she accepted a job teaching at Princeton University and Bennington College. She decided it was time to stop relegating her poetry to her irregular spurts of free time on weekends, nights and vacations and, instead, make it her primary priority. Because of her extensive education and legal career, Youn’s poetry takes on an elevated sense of technicality. It is especially scholarly, calling on lawyerly language and form. Mindy Dunn, the creative writing MFA program administrator, said that Youn’s particular poetic style makes her work especially unique. “Many times when we think about poetry we think about lush language and gorgeous imagery, so Youn’s analytical style is not what we usually expect,” Dunn said. Attendees of the Efroymson Center for Creative Writing poetry lunch hour on Youn admitted that the technical, scholarly and lawyerly approach to her poetry makes her work particularly challenging. Many admitted to resorting to dictionaries and YouTube tutorials in order to understand its depth. Yet, Dunn said Youn’s more challenging work is justified. Natalie Tombasco, a MFA student in poetry, said that Youn’s legal background is what makes her stand out from the rest. Youn’s most recent collection, “Blackacre,” refers especially to Youn’s legal background, as the title is a legal term for a hypothetical piece of land. In the poetry collection itself, Youn explores the possibilities behind what every individual is given in life, examining the intersection between imagination and fixed fact. Looking at her own life, in particular, “Blackacre” delves into Youn’s own experiences with fertility. Tombasco was in awe of the collection, recommending it to all. The combination of the legal aspects of “Blackacre” and its conceptual considerations speaks to the nature of Youn’s work. Dunn commented on this link between Youn’s career as a lawyer and her career as a poet. “She’s a Yale-educated lawyer, and I’d argue the democracies of her poetics reflect this; that perhaps because she is used to working with the abstract concepts of the law, and at a very high level, in front of the supreme court, her poetic register is similarly high and abstract,” Dunn said. Youn is one of the last visiting writers to come to campus this semester. While she is at Butler, she will be working with Manuscripts, an annual magazine that publishes the work of undergraduate students throughout Indiana. On Nov. 1, Youn will act as the guest judge in the poetry contest put on by Manuscripts. The magazine’s staff chose five poetry pieces out of all that had been submitted, sending that select number to Youn prior to her visit to campus. While here, Youn and the staff will discuss the work, leaving Youn to have the final say in who will be named the finalist and runner-up. A member of the Manuscripts staff will also interview Youn on Nov. 3. Karl Agger, editor-in-chief of Manuscripts, said that Youn’s involvement with the magazine is an especially beneficial opportunity provided by the Visiting Writers Series. Agger explained that this opportunity to interact with professional writers like Youn is inspiring. The Visiting Writers Series provides a certain tangibility to the community as students, faculty, staff and more witness successful literary careers first-hand. Tombasco explained that this tangibility is important in regards to poetry like Youn’s, for it makes the work more approachable, especially for students. The 2017-18 Vivian S. Delbrook Visiting Writers Series features a total of 12 writers on Butler’s campus. Dunn credited it as an invaluable program that must be taken advantage of. Youn’s presentation is Nov. 2 at 7:30 p.m. in the Johnson Room of Robertson Hall. The event counts as a BCR credit and does not require tickets. It is free and open to all.